Managing expectations is (probably) impossible. Hello — Adam here from the team. Recently we announced details for the launch of Astroneer and that’s something we’re super proud of. Now that the information is out, there’s been two important topics that come up in discussion amongst the team. How will our game be perceived and are we setting the correct expectations? I don’t enjoy writing about the missteps of other developers, but in the name of transparency I think this is an important point to make: The controversial release of No Man’s Sky fuels a lot of discussions about the development and marketing of Astroneer and more importantly the reaction the gaming community had to it. A lot of the press coverage about Astroneer links the two games together and we’ve seen a lot of talk amongst our community about those connections. I’m not going to comment on one specific aspect of the game or the people behind it. This blog post isn’t about that. I want to take this opportunity to put into practice the most important thing we’ve learned from witnessing No Man’s Sky: Know what you are saying, but understand what is heard. 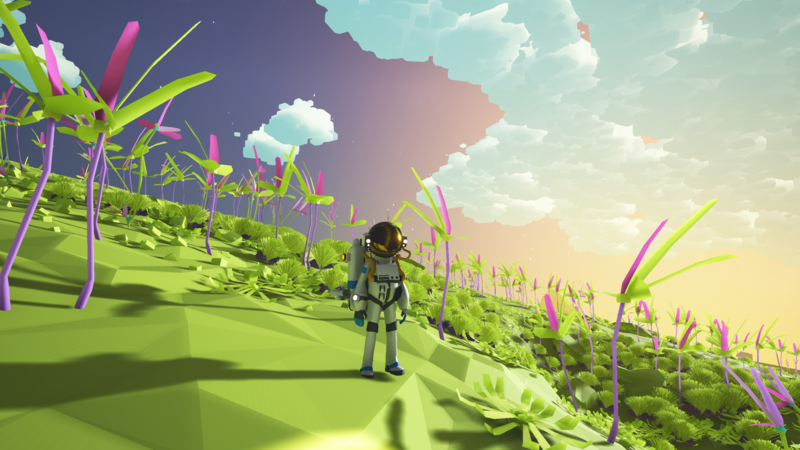 I grabbed this screenshot the other day when we first implemented some clouds in to the game.